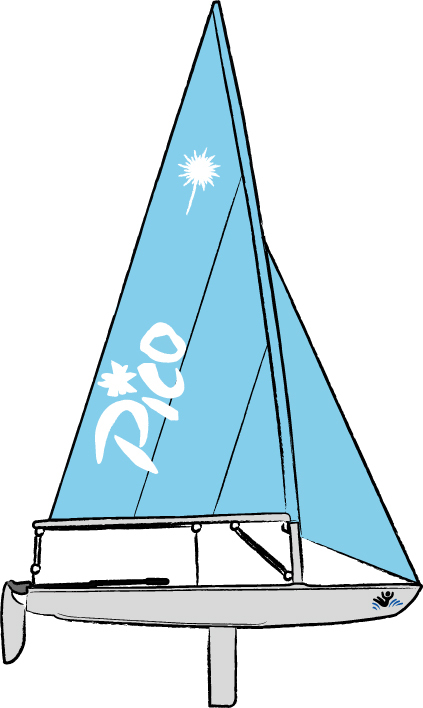 Pico's are really good little boats - as a lightweight adult I learnt to sail in them and then bought one. The larger, battened sail makes it quite a different sailing experience than with the training sail and in really windy weather they're easy boats to reef if you need to. Pretty easy to right after a capsize too! Although they can be tricky in short choppy waves, they are surprisingly well behaved in larger waves. Enjoy! On our first day in Greece we got to sail Pico's - It was blowing Force 5 and they wouldn't let anything else on the water! We had them double reefed, adults sailing Picos, in a sheltered bay that still had 2-3 foot swells, and it was damn good fun. They were a little slippy on the sides, and it'd be nice to try them again in conditions that weren't overpowering, but they were still good fun to sail.